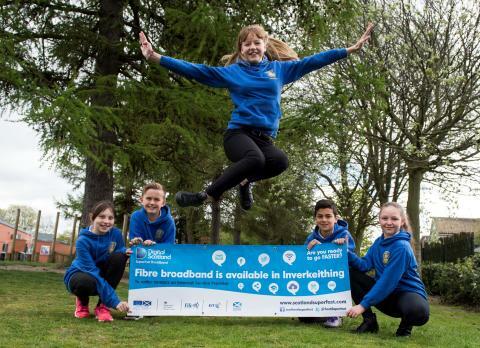 Inverkeithing pupils welcome more fibre broadband to the town. Pupils at Inverkeithing Primary School in Fife this week got the chance to climb aboard the Digital Scotland Fibre Showcase, a unique vehicle which features equipment used in the roll-out of fibre broadband. More than 800 Inverkeithing households and businesses can now access high-speed fibre services thanks to the £428 million Digital Scotland Superfast Broadband project. Local people need to sign up for the new, faster services with an internet service provider, as upgrades are not automatic. During the visit, pupils learned about fibre broadband and how it’s delivered. The local premises are among more than 715,000 homes and businesses across Scotland which are now able to access fibre broadband through the Digital Scotland rollout, led by the Scottish Government. Other local areas to benefit from the programme include Hillend, Rosyth and Kingseat as well as parts of Dunfermline and Dalgety Bay. More local coverage will follow as engineers from Openreach, the local network business which is part of BT Group, continue work on the ground. Whether you own a business, work from home or want to keep in touch with friends and family, fibre broadband enables multiple users to connect to the internet at high speeds and get better, faster access to online services. Sara Budge, Programme Director for Digital Scotland Superfast Broadband, said: “It’s fantastic news that the programme has been able to benefit residents and businesses in and around Inverkeithing. BT is investing £126 million in the Digital Scotland rollout. Robert Thorburn, BT Scotland’s Fibre Broadband Director, added: “We hope Inverkeithing pupils had fun finding out how high-speed technology powers the internet – and who knows, maybe we even inspired a few engineers of the future. Funding partners include the Scottish Government, Highlands and Islands Enterprise, BT, the UK Government through Broadband Delivery UK (BDUK), local authorities and the European Regional Development Fund.